5 Healing and Empowering Gemstones for Empaths. We are all sensitive creatures—absorbent sponges by nature—because we are not only physical, but also energetic beings. But some of us are so open to other energies, by blueprint and by the conditioning of our experiences, that we are easily overwhelmed by our bustling world. 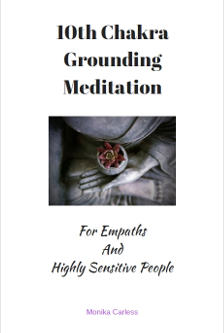 In my own experience as an empath, I’ve suffered an increase in discomfort when my personal space is influenced by other human beings, in crowded or noisy situations, or even just around my beloved—as I am so finely tuned to other frequencies. Now this kind of tuning in is helpful when I’m reading Tarot cards for clients or feeling my way through life in general. But at times it is so overwhelming that I am exhausted from a few hours in town or a few minutes in a store or someone’s home. Even a walk in nature can be dense with signals. If you are an empath, you know what I’m talking about. We are like lightning rods attracting the vibrational energy of everything that exists on the planet. Sometimes we laugh about it, or take a ribbing for being overly sensitive. However, the symptoms empaths deal with range from slightly aggravating to life threatening, and should not be taken without pause as to their effect. “You are meant to shine. Be patient, the rest of us are still learning about who you are,” is something I have said when explaining that the world is still learning how empaths function. Many empaths are creatives, work with nature or animals, are intuitive or psychic, may be labelled ADD/ADHD, are deep thinkers, are comfortable in other realms (astral travel, lucid dreaming), or may be reclusive. Check, check, and check! It’s not always a comfortable life, but I would not have it any other way; and so say many of my empath connections. Being an empath is a gift on many levels. But we do need to help ourselves manage our day-to-day existence. Empaths can often experience physical manifestations of their sensitivity, and after a while, this can become debilitating. Protection of one’s environment is key. Next Full Moon In Cancer.